﻿ What is the "Gathering" of Matt. 24:29-31? Matt. 24:29-31 describes the coming of Christ in the events culminating in the destruction of Jerusalem, AD 70. Verse 31 says "And he shall send his angels with a great sound of a trumpet, and they shall gather together his elect from the four winds, from one end of heaven to the other." What is this "gathering"? There are several views, but the one that we have settled upon at this time is that this is Christ's gathering the saints unto rest by martyrdom. "Again the kingdom of heaven is like unto a net, that was cast into the sea, and gathered of every kind: Which, when it was full, they drew to shore, and sat down, and gathered the good into vessels, but cast the bad away. So shall it be at the end of the world: the angels shall come forth, and sever the wicked from among the just, and shall cast them into the furnace of fire: there shall be wailing and gnashing of teeth" (Matt. 13:47-50). The word "gather" in these passages is from the same Greek word in Matt. 24:31 (Grk. episunacousiv). Another passage setting forth this same lesson is the parable of the wheat and tares (Matt. 13:24-32). In that case, both are allowed to "grow together until harvest" (v.30). At harvest, the tares are gathered and burned, while the wheat is gathered into the barn. How was the burning up of the wicked accomplished in all these cases? Answer: by the cataclysmic judgments that overtook the Jews and witnessed the nation's destruction. Since the harvest of the wicked contemplates the DEATH of the unbelieving Jews (and Romans), it follows that the harvest of the wheat was also accomplished by death; viz., MARTYDOM. "Now we beseech you, brethren by the coming of our Lord Jesus Christ, and by our gathering together unto him, that ye be not soon shaken in mind…for that day shall not come except…that man of sin be revealed, the son of perdition" etc. (II Thess. 2:1-3). Thus, the gathering unto Christ is clearly connected with the revealing of the man of sin. The argument may be stated thus: The saints would be gathered at the revelation of the man of sin (Nero). The revelation of the man of sin was the persecution under Nero. Therefore, the saints would be gathered in the persecution under Nero. This is confirmed by Rev. 14:9-16. "And the third angel followed them, saying, with a loud voice, If any man worship the beast and his image, and receive his mark in his forehead, or in his hand, the same shall drink of the wine of the wrath of God, which is poured out without mixture into the cup of his indignation; and he shall be tormented with fire and brimstone in the presence of the holy angels, and in the presence of the Lamb" (vv. 9-10). "Here is the patience of the saints: here are they that keep the commandments of God, and the faith of Jesus. And I heard a voice from heaven saying unto me, Write, Blessed are the dead which die in the Lord from henceforth: Yea, saith the Spirit, that they may rest from their labours; and their works do follow them" (vv. 12,13). "And I looked, and behold, a white cloud, and upon the cloud one sat like unto the Son of man, having on his head a golden crown, and in his hand a sharp sickle. And another angel came out of the temple, crying with a loud voice to him that sat on the cloud, Thrust in thy sickle, and reap: for the time is come for thee to reap; for the harvest of the earth is ripe. And he that sat on the cloud thrust in his sickle on the earth: and the earth was reaped" (vv. 14-16). Here then is the eschatological harvest of the saints: The parables in the gospel foretold the harvest, but did not explain how it would be accomplished. Here, however the answer is provided. The closing verses of the chapter portray the harvest of the grapes of wrath (Jews) tread "without the city" (vv. 17-20). It is interesting that wheat harvest occurs about June, but the vintage is not ripe until fall. Thus, chapter fourteen follows established agricultural facts. 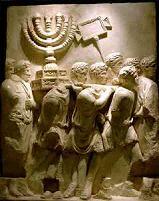 The symbolism also follows the history of the persecution and the Jews war with Rome. The persecution under Nero lasted from AD 64-68; the Jewish war lasted from AD 66-70. Thus the two overlapped for a time, with the war beginning and ending later. More to the point, however, the imagery is identical with the parables of the end time, when the righteous would be gathered home, but the wicked burned up like chaff. The imagery of Rev. 14: 14-16 is identical with Matt. 24:29-31. Both portray the Lord coming in the clouds, exacting vengeance upon his enemies, but gathering the saints into the eternal kingdom. "And it shall come to pass in that day, that the great trumpet shall be blown, and they shall come which were ready to perish in the land of Assyria, and the outcasts in the land of Egypt, and shall worship the Lord n the holy mount at Jerusalem." "In the day of atonement shall ye make the trumpet sound throughout all your land. And ye shall hallow the fiftieth year, and proclaim liberty throughout all the land unto all the inhabitants thereof: it shall be a jubilee unto you: and ye shall return every man unto his possession, and ye shall return every man unto his family" (Lev. 25:9, 10). This is clearly the source of Isaiah's imagery, when the Jewish captives in Assyria and Babylon, and the exiles in Egypt would "return every man unto his possession." Jesus employs the like language to describe the gathering home of his saints at the eschaton by death under Nero. "Immediately after the tribulation of those days shall the sun be darkened, and the moon shall not giver her light, and the stars shall fall from heaven, and the powers of the heavens shall be shaken: And then shall appear the sign of the Son of man in heaven: and then shall all the tribes of the earth mourn, and they shall see the Son of man coming in clouds of heaven with power and great glory. And he shall send his angels with a grout sound of a trumpet, and they shall gather together his elect from the four winds, from one end of heaven to the other." "And ye shall hear of wars and rumours of wars: see that ye be not troubled: for all these things must come to pass, but the end is not yet. For nation shall rise against nation, and kingdom against kingdom: and there shall be famines, and pestilences, and earthquakes, in divers places, all these are the beginning of sorrows" (Matt. 24:6-8). When Jesus says "immediately after the tribulation of those days" it is to these events, preceding his return and the fall of Jerusalem, that he refers. We see this in Revelation where there were intermediate judgments in the form of seals and trumpets that preceded the final cataclysm that saw the destruction of Christ's enemies. It should also be borne in mind that Jesus' coming was not a one day or even one year event: Jesus' return stretched over the whole period of the Jewish war with Rome (AD 66-70), and the Roman civil wars that broke out at the death of Nero (AD 68-70). When a kingdom comes in power, it comes in force to make war and assert its right and dominion. This obviously entails a sufficient time to subdue the enemy. The same is true here: the day of the Lord and coming of Christ was fulfilled in the world events culminating in the Roman civil wars and destruction of Jerusalem. His coming would avenge the saints, who were gathered home in martyrdom where they received the crown of life. The gathering of Matt. 24:29-31 refers to the end-time harvest of the saints, when they were gathered home to Christ in death under the Nero and the Jews.